Do you work in a job that requires you at a desk and/or computer daily, sitting hunched over your keyboard? How often do you spend with your neck craned forwards, looking down at your smartphone, per day? If you are a coach, ask yourself "how many of my clients fit the above demographic?". Do they struggle with overhead movements or holding the bar correctly in a back squat? Even achieving a full range of motion in a press up will be affected by the ability the shoulders have to move into extension. If you experience upper back and neck pain, this can often be as a result of an overly pronated posture (shoulders pulled forwards), due to tightness across the chest and in the shoulders. Shoulder extension (increasing the angle of the joint past 90 degrees) is a hugely neglected range in 90% of the population. This ranges from children right through to the elderly, where it is probably the most important to maintain, reducing the risk of injury and resulting in a healthy body as a whole. In order to maintain good shoulder health, it is important that we maintain mobility and work to develop strength through the full range of motion. This is especially important if we want to progress on to more complex bodyweight exercises such as gymnastic ring work and olympic lifts as, without a good level of active and passive mobility, injury will likely result. Many people make the mistake of thinking that because they are fairly strong, they will be able to jump straight into advanced exercises, such as 'german hangs' or 'skin-the-cats', as they look impressive and your ego tells you "I think I can do that!". Unfortunately, the result is often damage to the bicep tendons or joint capsule and a long road to recovery. Below are my top 5 bodyweight exercises for improving the range of motion about the shoulder, focusing especially on shoulder extension to build up your strength and mobility gradually, in order to avoid injury. This drill is very effective to use as part of your movement preparation and warm up, as well as an active rest between sets. It is easy to control the amount of stress that you are putting through the shoulder. This can also be included in daily movement practice to improve the range of the shoulder gradually in all populations. 1. Lying face down on the floor, extend one arm out to the side, keeping the wrist, elbow and shoulder in contact with the floor at all times. 2. 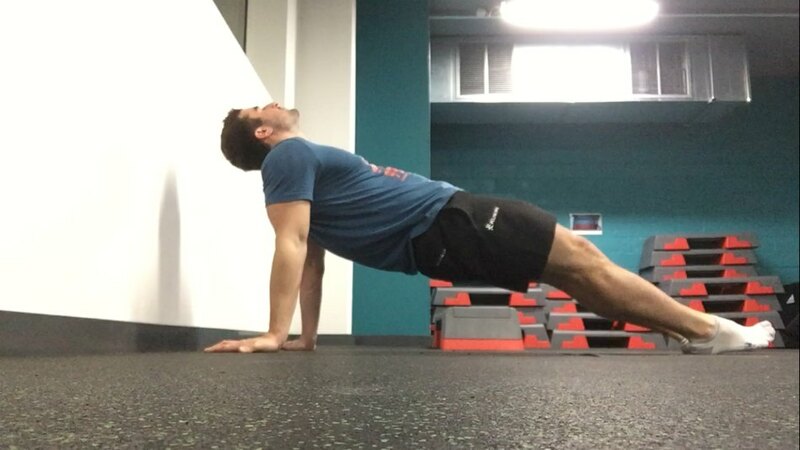 Use the other arm to push yourself up and over to create a stretch through the chest (pec), anterior (front) shoulder and bicep, possibly even the forearm if you have particular tightness there. 3. Pause briefly, feeling the stretch, before repeating on the opposite side. 4. Each time you alternate, change the angle of the arm being stretched. You will probably find that, at certain angles, you will feel more of a stretch than others. You will need to work these more often. 5. Perform 20 reps/side of each variant, or work for time, depending on your preference and current mobility level. The bent arm variant targets the pec minor stronger. Tightness here, or in the bicep, is often responsible for the lack of shoulder mobility in extension. Perform the above as stated with the arm at different angles. There will probably be a certain range in which you feel the stretch more, this is suggesting that you should focus here for longer. (The shoulder will raise off the floor slightly when performing the bent arm version). This is a more focused stretch than the clock drill and one that many people may struggle with initially. The use of a barbell/stick that you are mark to show where your hands can be helpful. Sitting on the floor, extend the arms out behind you, fingers facing away (externally rotated arms), and aim to get the little fingers to touch. Keeping the arms straight, walk the hands back as far as you can, squeezing the shoulder blades together in the process, keeping your bum on the floor. You may feel tension in the chest, anterior shoulder and/or bicep which may manifest as elbow pain. DO NOT push into the pain. Mild discomfort is acceptable but it is not worth straining the soft tissue as it takes a long time to recover. Either perform reps of 'walk-out and back' (you can use a barbell to assist here) or 'loaded static holds' for as long as it is comfortable. I would recommend that these be performed at the end of a session where you are fully warm and can spend longer focussing on the stretch specifically. Remember to keep breathing and relax into the stretch with each exhale. This exercise is challenging and is a test, not only of shoulder extension, but also extension of the hips, lumbar and thoracic spine. Yet this is one that is extremely useful for developing flexibility throughout the major joints. Lying on your back, begin with the feet flat on the floor, reach the hands over the head and place them palm down on the floor (fingers facing towards your feet). From here, push through the feet and hands forming an arch with the body. The arms should be straight and there should not be too much pressure through the lower back. If you feel pain in the lower back, you need to regress the exercise and work on improving your shoulder and thoracic spine mobility first. 3. Hold for time or perform slow reps with an isometric (static) hold at the top of each. To regress this exercise, simply elevate the feet onto a box, bench or something higher. Adjust the height until you can perform the movement without pain and are able to hold the position with straight arms and no pain, before moving on to a lower foot position. Another bodyweight exercise. This is more of a dynamic stretch/joint strengthening exercise due to the increased load through the joints as we move through the movement. This can be used to great effect as active rest in between sets. Begin in the seated position, plant the feet and place the hands on the floor by the hip (initially with the fingers facing out at 90 degrees but you can progress to fingers facing backwards as for the seated extension). 2. From here, squeeze the glutes and extend the hips, pushing through the feet and squeeze the shoulder blades together, resulting in all the weight being transferred through the feet and arms. This should provide a good stretch through the chest, anterior shoulder, bicep and forearm. 3. Repeat for reps or time, perform in a controlled fashion with an isometric (static) contraction (build up the time in the isometric holds as strength improves) at the top to emphasise the stretch, ensuring that the hips are fully extended and shoulder blades pulled together at the top of each rep.
An extension exercise that can be progressed on nicely towards the manna (a very high level bodyweight exercise), but is very good for developing straight arm strength in extension. Similar to the table rocks, it is important that you squeeze the glutes and shoulder blades together throughout this exercise. Begin with legs extended, feet together and toes pointed. You can begin with the hands facing outwards in line with the hips, but the aim is to perform this with the hands facing backwards and full external rotation of the upper arm. Contract the glutes to extend the hips and squeeze the shoulder blades together throughout. Work this position as you would the plank, with isometric holds for time. Work up to 60 seconds holds before elevating the feet onto a bench or block to increase the shoulder extension needed. As mentioned earlier, this is a good way to help progression onto v-sits and the manna, if you want to progress onto the high level bodyweight exercises. Try incorporating these exercises into your current training and see how they help to improve your shoulder health and mobility. They are great to use as active rests in between sets of other exercises and as part of a core routine. For more information on how these can be used, please get in touch with myself or one of the Combined Strength Coaches. Take the time to practice these movements and then build on them. They are, by no means, the only exercises to improve this range, and in the forthcoming articles, we will be exploring how to; incorporate partner assisted drills, bars, resistance bands and gymnastic rings, in order to give you a wider range of options when it comes to training yourself and helping your clients to progress.